Selkirk College writing instructor Almeda Glenn Miller has brought together an interesting blend of talent for a Friday night event at Kootenay Studio Arts in Nelson. Poetry, music and an open stage will all play out in what is sure to be a special evening. 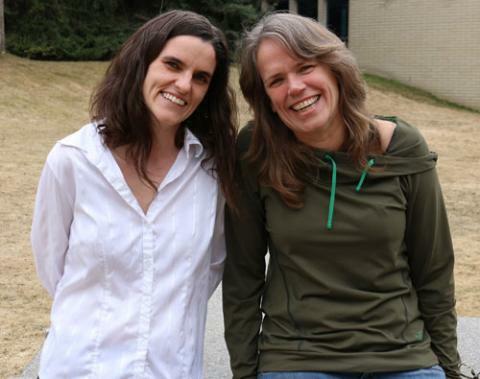 April is National Poetry Month and Selkirk College writing instructor Almeda Glenn Miller and Business Administration student Melissa McCready are combining efforts to create a delicious metaphor. Miller is currently promoting her new book, a volume of poetry titled Begin with the Corners. On Friday night at Nelson’s Kootenay Studio Arts, Miller will be performing poems set to music by McCready and Shannon Moldenhaur who make up the local duo Motes and Oats. They will be joined on stage by book designer Shelley Ackerman who will be offering harmonies. Selkirk College Business Administration student Melissa McCready (left) and writing instructor Almeda Glenn Miller are teaming up for an event in Nelson on Friday night. Miller will be reading from her new book of poetry Begin with the Corners while McCready—one half of the local band Motes and Oats—will be helping provide the music. Performance is nothing new to Miller. Her first incarnation as an actress and performance artist got put aside when she wrote her first novel, Tiger Dreams, in 2002. Since then Miller has been writing stories, essays and poetry for literary quarterlies across the country. Begin with the Corners is her first collection of poetry. Friday night will also include a poetry jam which should provide another opportunity for writers to figure out ways to collaborate. Motes and Oats have teamed up with Miller and Ackerman to record an album of the music they’ll be performing on Friday. Copies of Begin with the Corners come with a free mp3 download of the album. Friday’s show begins at 7 p.m. in Room 310 at the Selkirk College Kootenay Studio Arts Campus (606 Victoria Street). Admission is by donation and there will be libations, chocolate, music and lots of words. Begin with the Corners is also available at Otter Books in Nelson, Café Books West in Rossland, the Selkirk College Bookstore in Castlegar and online at bigbadwolfpublishinghouse.com. Learn more about Selkirk's University Arts & Sciences Program and join us on Facebook.